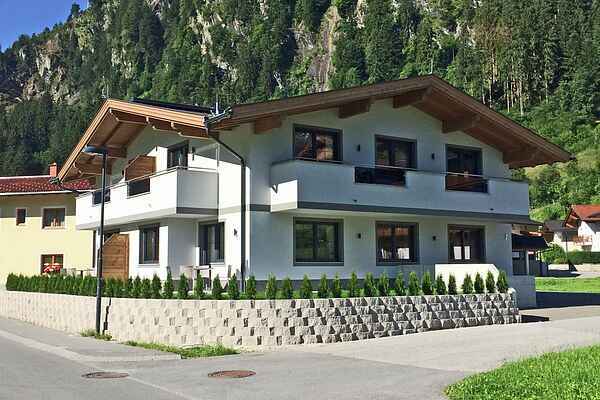 This brand new holiday home - its construction was only finished in 2016 - is located in close proximity to the two ski lifts of the Penkenbahn and the Horbergbahn at Mayrhofen. This location gives you easy access to any of the surrounding ski areas. You will get there in no time! The ski bus essentially stops on your doorstep. All apartments are brand new. They are furnished in a way that exudes modernity, style and superior quality. This should help you unwind completely. You will get to enjoy a big combined sitting room and bedroom along with a kitchen, two bedrooms, a bathroom, and of course, a terrace or balcony.